The death of Tom Crean on September 8th this year has left a palpable void in the annals of music-making in Ireland and a few personal memories, though scant and merely touching the surface, may help to make this clearer. Although Tom had not been particularly active over recent years he would still offer songs, many familiar from the halcyon days of The Tradition Club in Slattery's of Capel Steet during the late sixties and on. He never claimed to have a huge repertoire; nor, indeed, a great voice - but the latter was unmistakeable: gravelly, I think, helps to describe it, a little breathless, perhaps; and very memorable when he rendered some of the Dublin favourites such as Dicey Reilly and Biddy Mulligan. Often, through the years, he had to be persuaded to sing and it was more likely that Tom would simply pop up during an afternoon session in a pub (or two) in the Wicklow hills or along the coast north of Dublin, in and around the city itself or in trips to a fleadh here and there. A kind of fame came with the formation of The Press Gang, an eclectic bunch who, in their then current manifestation (not the first), surprised this writer on first encounter by singing several songs heard first from the Copper and Waterson families (this would have been between 1967 and 1970). The Pressies went through more than one team-sheet but, at that time, worked clubs and other venues all over Dublin (Trinity College Ball one unlikely venue) with a line-up comprised of Tom, Niall Fennell (who also played the French horn - sometimes, indeed, in Slattery's), Dave Smythe, a photographer at The Rotunda hospital and possessed of a brilliantly wicked wit, and the talented Sean Corcoran - who got things done, often - it seemed - in spite of himself, especially in his home county of Louth and out collecting songs - he it was who introduced me to Mary Anne Carolan, a sublime encounter. The boys were most frequently bewildered by their success, even when they retired and then re-formed for the occasional gig: 'Who are these ould fellahs ...?' They did make an almost obligatory LP record (a proud possession of mine) but were never, so to speak, wooed commercially. The most substantial contribution to Irish music, though, that Tom was involved in would have been the setting up of the Tradition Club (as Jerry O'Reilly has already noted). This venerable institution, like The Pressies, went through transformations from time to time, taking its cue from predecessors, but, as the sixties drove through into the seventies, achieved a fairly permanent shape. Kevin Conneff, not, at that time, with The Chieftains, became a prominent part of the organisation and was most obviously a key figure with his own singing and with his command of Irish that smoothed the path of Irish-speaking visitors and helped to pave the way too for exploration of Irish culture throughout the country. This, to a wide-eyed and pretty naïve visitor, was a bonus. Sean Corcoran, too, pursued a similar trajectory. Tom, as it happens, improved on his own Irish capabilities as the years progressed. When Finbar Boyle, anothr Irish speaker, joined the ranks, yet another stone was laid in the revival (I think this a fair description) of Irish singing - more so, perhaps, the opportunities given to singers in Irish at the club and elsewhere. The Tradition Club could not either be seperated from the upsurge in Irish piping along with Na Piobairi Uillean. Guest lists read like the proverbial Who's Who. During my first three months in attendance, I heard Seamus Ennis, Solus Lillis, Eddie Butcher, Mary Bergin, Joe Holmes and Len Graham, Festy Conlon, Paddy Keenan and Matt Molloy solo, Sean Keane, John Kelly and his sons, John junior and James - a little later, Bobby Casey, Mairéad Ni Mhaonaigh and Frankie Kennedy, Triona Ni Dhomhnaill ..and on and on and on and with many more not here mentioned. The Tradition Club brought singers and musicians to Dublin from all over Ireland, paying them a decent wage for time lost at their respective places of employment: an unheard of proposition all round at the time. We should not forget, either, that there were guests from elsewhere - Patric Sicart and others from Brittany; Al Atkinson, 'Scotty' and others from England at a time when the perception of an English singer in Dublin was of someone who sang shanties to the accompanment of a concertina (which is why the Copper and Waterson repertoire was so unusual) ... One might well blame Bert Lloyd (and Alf Edwards) for this - and, indeed, the great man duly made his appearance in The Tradition Club. It was a major, long-lasting venture, sadly brought to a close some twenty-odd years on. Let us not forget those behind the scenes who worked so hard - including Mag Crean at the door and the genial Paddy Slattery himself. But the significance of the club was not just in itself. After all, there had been other clubs ... One recalls, for instance and with much pleasure, the hilarity at the Neptune Rowing Club where The Pressies sang regularly on Friday nights ... The point about the Tradition Club is that it went further than anybody before as the way in which it exposed singers and musicians at the club suggests and was crucial to the setting-up of the Willie Clancy Memorial Week, offering financial aid for a start. It was a stated intention, too, for the club to subsidise young musicians and singers at such events. I believe this to be very much result of Tom's life-long adherence to socialist principles and his rise from his position as a humble gas-fitter - riding to work on his bike - through the ranks of various unions to the heights of being General Secretary of the Workers Union of Ireland (later SIPTU), a post that made severe demands on the man and his family but to which Tom was dedicated - and was a successful and respected practitioner in negotiations and in encouraging general welfare. Naturally, like minds met - Sean Corcoran was very much of a leftish persuasion. That being said it is also time to offer a few thoughts on Himself as opposed to the public figure. Many's the time when a gang of us would congregate out on the Strand for a game of Sunday football - once, almost in Tom's backyard in Donnycarney, two whole teams were engaged including a fine centre-back from Sweeneys Men, Terry Woods, and a scampering Andy Irvine and a slightly timid - judicious is perhaps a better word as the tackles flew in- Johnny Moynihan. The aftermath in Coles' pub was a delight amongst Tom's friends. But many's the time we would also troop muddily to Tom's home and his Ma's wonderfully sustaining 'brack'. There were late-night, mostly hilarious, discussions there, too, mainly about music. Tom, it should be said, was a 'solid man' in respect of football and you would sometimes think twice about challenging him in the air. Outside Dublin, when a group of us were able to rent a cottage in the hills, football would be the first option between walking and supping; darts a second. There is no doubt that Tom's darts techniques had been honed by playing the game along with his workmates. More so: through the same agencies, he was an expert card-player. And a good golfer too ... One remembers - again with laughter first and foremost - ventures out onto the Curragh and elsewhere to Par Three courses where Tom's driving on the range was especially noteworthy. Rather less salubriously at that time in the hills, it was Tom who was the principle and necessary mover in the emptying of the 'honey-bucket', then in situ. 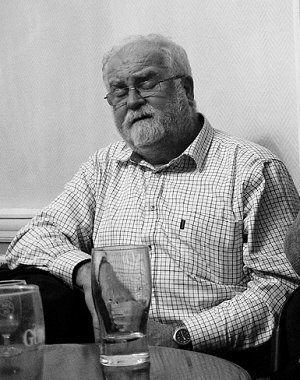 Tom was also fond of the Irish games of hurling and Gaelic football and took this novice to football games at 'Croker', stationing us on 'Hill 60' where no quarter was given to visitors and strangers - this was during the days of 'Heffo's Army ...' - perhaps obscure references to many readers but, be assured, a lively time in the annals of Dublin football especially. The memories pile up, of course - trips out to places such as Farrell's of the Ward, a 'bona fide' as it was called, allegedly open at all hours to genuine commercial travellers and a forerunner of those pubs that much later indulged in karaoke - a battered piano and a battered pianist being the operative mode; and to the fleadhanna - Cashel, Listowel and so on ... with a continued holiday sometimes, as at Westport, to Carraroe and an awesome encounter with the singer Pádraig Ó'Cáthain - and on then into the Joyce country - Tom Crean presiding: really, the most splendid introduction to the Irish countryside and to Irish people of every hue with whom Tom so obviously had an immediate rapport: genuinely fabulous trips into the hinterland of an unknown and often much misunderstood and even despised neighbour - a salutary and fascinating education. Then there was 'Sally' night at the Cana Inn on a Thursday when you sang anything but from your usual repertoire and this was interspersed with games of bar billiards - Tom was ann inveterate maker of breaks - and a pause to watch the 1948 Show, precursor of Python. This was a place of uproarious Dublin humour the legacy of which still evinces smiles and cackles ... And one was always included, being asked to sing. As the years passed so Tom also became enamoured of a different kind of singing - in the Peoples' Choir that has enjoyed trips to Europe. This, in turn, reminds me of the initial carol-singing in the stresst of Dublin, based on the Cana crowd's enthusiasms and which, in fact, preented the first occasion on which I met Tom. As to Tom's own domestic scene: there was his meeting of Margaret McConville and her family ... and the staggeringly funny (for some of us, at any rate) and impressive Easter wedding of Tom and Mag (did you ever meet the best man coming back from the pub when you slid out for relief and a top-up?) - certainly as good as the best of wakes; their setting up home in Dublin, with famous New Year parties in Hamilton Street; eventually a settling in on the north side; the raising of a family (Lucy, Aengus and Katie), Mag's nursery education ventures, and Tom's regrettable secession fromdirect traditional musical activity ... In all this, Tom and Mag were ever kind and generous hosts and he was one of the most stalwart friends - always, for instance, addressing me as 'Brother' and not necessarily joking nor making any kind of 'political' point: that was not his way at all. The numbers of people involved in Irish music-making whom one encountered at the Crean home was amazing - simply too many to list. But, too, there were people from other worlds - from unions, from the ranks of politicians, writers and artists...a whole sometimes surprising moxy - chiefly, it should be said, good friends and neighbours. In a way, Tom represented those many people who, once given an opportunity, threw off the shackles of a poor (a desperately poor), emerging nation and enjoyed a great flowering of Irish culture and influence and economic success (soured later or not). Ultimately, Tom has had a lasting influence on this writer because he opened up such perspectives, particularly musical ones but also with a shrewd and not always comfortable eye on Ireland as a modern state; above all through his steady and, at times, very touching loyalty. Even recently, Tom and Mag used travel over to Tocane sur Apre, but an hour and a bit from here in Haute-Vienne, where the annual rencontres irlandaises takes place and one was able to rekindle old friendships and enjoy fresh phases of music-making; and still Tom offered new encounters with those he knew, often from his Union and political contacts ... none of whom were in any way pressing or dictatorial. During one recent occasion at a restaurant near to Tocane it occurred to me that a single hand-grenade would have left Ireland bereft of the whole of the hierarchy of Irish Labour Party (including a now government minister) - but I offered two good bottles instead. Ah, me. In fact, Tom was a sound judge of the real merits of people of all persuasions (and happy enough to castigate those who did not live up to high principles - in spectacular language at times). Tocane was where I last heard him sing, just popping up amongst the assembled crowd and modestly, as usual, making his contribution. And sadly, sadly, that was where we last met in 2012. I daresay that many readers would be able to recount similar histories and still leave out a huge part of particular relationships; but, then, although this may be a somewhat digressive piece, it is intended to remind you of your own best buddies. Never let them fade from your memory. And in this respect I'd just like to add that one of Tom's special gifts to me lay in the fact that he was one of the most natural and gifted funny men that I've ever encountered. Life with Tom, whilst it had a proper serious side, was one where, with the very first eye contact, let alone handshake, one's heart lifted and one knew that, subsequently, there would be prodigious stream of comment and story-telling, often against himself, that would literally shake one's body and soul with joy. In this, I am very sure that Tom Crean will be missed by many more than me.